FRANKFORT, KY — The residents at the Lantern at Morning Pointe Alzheimer’s Center of Excellence, Frankfort enjoyed their Family Night celebration with a special singing by the talented 2014 Miss Outstanding Kentucky Teen Alexandria Francke. The seniors at the Alzheimer’s memory care community also enjoyed a photo booth to take funny pictures and breakfast for dinner Lumberjack style — pancakes and all the fixings. Morning Pointe invites a variety of special guests to spend quality time with the residents as part of the Meaningful Day(tm) program. 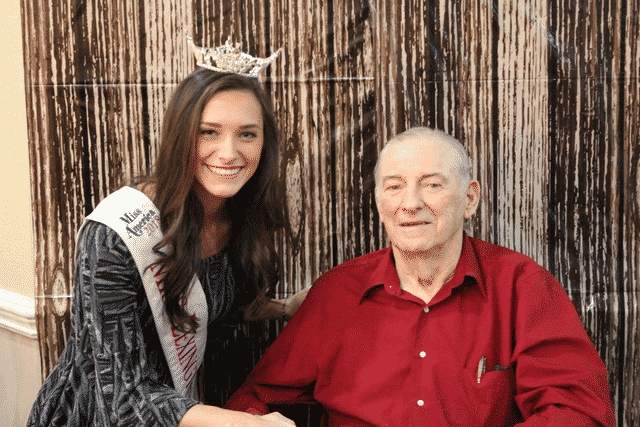 Photo: The Lantern at Morning Pointe Alzheimer’s Center of Excellence, Frankfort resident Dennis Smith meets 2014 Miss Outstanding Kentucky Teen Alexandria Francke who sang for the residents at the Alzheimer’s memory care community.